Name Index Living (private). Parents: Living and Living. Elias WHYNOCK was born on 18 November 1860. He died on 17 September 1929 at the age of 68 in Blue Rocks, Lunenburg County, Nova Scotia. He was buried in Blue Rocks, Lunenburg County, Nova Scotia. Parents: Johan George WEINACHT and Sophia HIMMELMAN. Spouse: Sarah Cassandra WHYNOT. Sarah Cassandra WHYNOT and Elias WHYNOCK were married on 6 October 1888. Spouse: Lucy Ann TANNER. Lucy Ann TANNER and Elias WHYNOCK were married on 11 August 1909. Emma Floretta WHYNOCK was born on 3 June 1891 in Blue Rocks, Lunenburg County, Nova Scotia. She died on 26 September 1972 at the age of 81 in Stonehurst, Lunenburg County, Nova Scotia. She was buried in the Lower Blue Rocks Cemetery. Parents: Henry Benjamin WHYNOCK and Ada Anna (twin) TANNER. Spouse: Albert Edmund TANNER. Emma Floretta WHYNOCK and Albert Edmund TANNER were married on 26 February 1908. Emmeline WHYNOCK was born on 19 January 1874 in Blue Rocks, Lunenburg County, Nova Scotia. She died on 2 February 1874 at the age of 0 in Blue Rocks, Lunenburg County, Nova Scotia. Parents: Johan Francis WHYNOCK and Sophia Rosina MORASH. Francis Nathaniel Napolean WHYNOCK was born on 4 February 1882 in Blue Rocks, Lunenburg County, Nova Scotia. He died in 1902 at the age of 20 in Newfounland. Parents: Johan Francis WHYNOCK and Sophia Rosina MORASH. Spouse: Edith Ellen May KNICKLE. Edith Ellen May KNICKLE and Francis Nathaniel Napolean WHYNOCK were married on 28 June 1901. Francis Robert WHYNOCK was born on 1 January 1881 in Blue Rocks, Lunenburg County, Nova Scotia. He died on 21 June 1961 at the age of 80 in Lunenburg, Lunenburg County, Nova Scotia. He was buried in the Hill Crest Cemetery in Lunenburg. Parents: Johan Francis WHYNOCK and Sophia Rosina MORASH. Spouse: Minnie Elma RICHARDSON. Minnie Elma RICHARDSON and Francis Robert WHYNOCK were married on 27 February 1907. Spouse: Hilda Naomi MASON. Hilda Naomi MASON and Francis Robert WHYNOCK were married on 29 December 1917 in Lunenburg, Lunenburg County, Nova Scotia. Spouse: Sarah Florence "Sadie" HEISLER. Sarah Florence "Sadie" HEISLER and Francis Robert WHYNOCK were married on 22 December 1922 in Halifax County, Nova Scotia. 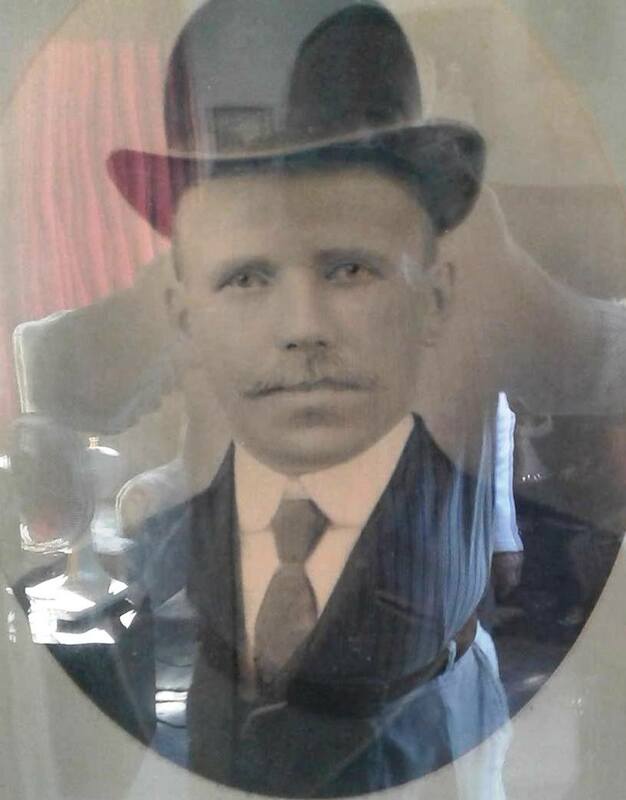 George WHYNOCK was born on 17 October 1871 in Blue Rocks, Lunenburg County, Nova Scotia. He died in 1959 at the age of 88. He was buried in the Lower Blue Rocks Cemetery. Parents: Charles Albert WEINACHT and Sarah Adelaide TANNER. Spouse: Sophia Salome TANNER. Sophia Salome TANNER and George WHYNOCK were married on 15 April 1892 in Lunenburg, Lunenburg County, Nova Scotia. George James WHYNOCK was born on 19 September 1855 in Stonehurst, Lunenburg County, Nova Scotia. He died on 27 April 1920 at the age of 64 in Voglers Cove, Lunenburg County, Nova Scotia. He was buried in the Sea Side Cemetery in Voglers Cove. Parents: John WHYNOTT and Maria Elizabeth GILFOY. Spouse: Bertha Martha BOWERS. Bertha Martha BOWERS and George James WHYNOCK were married on 5 February 1876 in Voglers Cove, Lunenburg County, Nova Scotia. Children were: Maud Ida WHYNOT, Alfred Kenneth WHYNACHT, Wildon James WHYNOTT, Clifford Stanley WHYNACHT, Ladonia Martin "Doane" WHYNOT, Raymond Harold WHYNOCK, Ariel Eldred WHYNOT. Harris St. Clair WHYNOCK was born on 21 July 1905 in Stonehurst, Lunenburg County, Nova Scotia. He died on 30 November 1933 at the age of 28 in Stonehurst, Lunenburg County, Nova Scotia. He was buried in the Lower Blue Rocks Cemetery. Parents: John Harris WHYNOCK and Nora Belle TANNER. Henry Benjamin WHYNOCK was born on 28 June 1867 in Black Rocks, Lunenburg County, Nova Scotia. He died on 8 February 1952 at the age of 84 in Stonehurst, Lunenburg County, Nova Scotia. He was buried in the Lower Blue Rocks Cemetery. Parents: John WHYNOTT and Mary Louisa SELIG. Spouse: Ada Anna (twin) TANNER. Ada Anna (twin) TANNER and Henry Benjamin WHYNOCK were married on 20 October 1886. Children were: John Harris WHYNOCK, William Roger WHYNOCK, Emma Floretta WHYNOCK, Minnie Louise WHYNOCK, Lottie Lelia WHYNOCK, Benjamin Basil WHYNOCK, Bennett Melvin WHYNOCK. Henry Ladonia WHYNOCK was born on 19 October 1921 in Voglers Cove, Lunenburg County, Nova Scotia. He died on 27 May 1987 at the age of 65 in Ipswich, Massachusetts. Parents: Raymond Harold WHYNOCK and Violet Ethel HOBBS. Spouse: Marie V BENJAMIN. Marie V BENJAMIN and Henry Ladonia WHYNOCK were married in 1942 in Massachusetts. Children were: Living, Living. Jennie May WHYNOCK was born on 28 September 1909 in Port Medway, Queens County, Nova Scotia. She died on 22 October 1909 at the age of 0 in Port Medway, Queens County, Nova Scotia. Parents: George Jonas WHYNOT and Sarah Sophia WHYNOT. Johan Francis WHYNOCK was born on 26 September 1843. He died between 1892 and 1901 at the age of 49. Parents: Johan Jacob WEINACHT and Catherine Elizabeth FAULKENHAM. Spouse: Sophia Rosina MORASH. Sophia Rosina MORASH and Johan Francis WHYNOCK were married in 1867. Children were: Sophia WHYNOCK, Robert Francis WHYNOCK, Sarah Elizabeth WHYNOCK, Emmeline WHYNOCK, Edward Chesley WHYNOT, Jacob Francis Norman WHYNACHT, Catherine Florence WHYNOCK, Francis Robert WHYNOCK, Francis Nathaniel Napolean WHYNOCK, George Cely WHYNACHT, Patrick Adolphius WHYNOCK, Stewart WHYNOCK. John Harris WHYNOCK was born on 11 September 1887 in Black Rocks, Lunenburg County, Nova Scotia. He died on 25 June 1957 at the age of 69 in Garden Lots, Lunenburg County, Nova Scotia. He was buried in the Lower Blue Rocks Cemetery. Parents: Henry Benjamin WHYNOCK and Ada Anna (twin) TANNER. Spouse: Nora Belle TANNER. Nora Belle TANNER and John Harris WHYNOCK were married on 8 June 1905 in Black Rocks, Lunenburg County, Nova Scotia. Children were: Harris St. Clair WHYNOCK, Luetta Dorothy WHYNOCK. Kenneth Raymond WHYNOCK was born on 23 July 1927 in Voglers Cove, Lunenburg County, Nova Scotia. He died on 25 May 2014 at the age of 86 in Danvers, Essex County, Massachusetts. He was buried in the Central Cemetery in Beverly, Essex County, Massachusetts. Parents: Raymond Harold WHYNOCK and Violet Ethel HOBBS. Spouse: Marilyn KNOWLES. Marilyn KNOWLES and Kenneth Raymond WHYNOCK were divorced in 1980. They were married. Spouse: Dorothy Marie HURLEY. Dorothy Marie HURLEY and Kenneth Raymond WHYNOCK were married. Lillian Bertha WHYNOCK was born on 7 August 1925 in Voglers Cove, Lunenburg County, Nova Scotia. She died on 27 March 2009 at the age of 83 in Santa Clara, California. Parents: Raymond Harold WHYNOCK and Violet Ethel HOBBS. Spouse: Marvin Dale BOTTUM. Lillian Bertha WHYNOCK and Marvin Dale BOTTUM were married in 1945 in Massachusetts. Children were: Living, Living. Lottie Lelia WHYNOCK was born on 2 June 1898 in Blue Rocks, Lunenburg County, Nova Scotia. She died on 5 January 1982 at the age of 83 in Lunenburg, Lunenburg County, Nova Scotia. She was buried in the Hill Crest Cemetery in Lunenburg. Parents: Henry Benjamin WHYNOCK and Ada Anna (twin) TANNER. Spouse: Thomas Urban KNICKLE. Lottie Lelia WHYNOCK and Thomas Urban KNICKLE were married on 18 December 1918 in Blue Rocks, Lunenburg County, Nova Scotia. Luetta Dorothy WHYNOCK was born on 11 July 1914 in Black Rocks, Lunenburg County, Nova Scotia. She died on 5 March 2001 at the age of 86 in Bridgewater, Lunenburg County, Nova Scotia. She was buried in the Lower Blue Rocks Cemetery. Parents: John Harris WHYNOCK and Nora Belle TANNER. Spouse: Worrell Lloyd GREEK. Luetta Dorothy WHYNOCK and Worrell Lloyd GREEK were married on 14 May 1934 in Blue Rocks, Lunenburg County, Nova Scotia. Children were: Living. Mary Eleanor WHYNOCK was born on 22 July 1853 in Lunenburg, Lunenburg County, Nova Scotia. Parents: John WHYNOTT and Maria Elizabeth GILFOY. Mary Elizabeth WHYNOCK was born in October 1890 in Port Medway, Queens County, Nova Scotia. She died on 12 October 1892 at the age of 2 in Port Medway, Queens County, Nova Scotia. Parents: George Jonas WHYNOT and Sarah Sophia WHYNOT. May WHYNOCK was born on 27 May 1884 in Blue Rocks, Lunenburg County, Nova Scotia. She died on 21 May 1973 at the age of 88. She was buried in the Hill Crest Cemetery in Lunenburg. Parents: Martin Alfred WHYNACHT and Mary MORASH. Spouse: Daniel Maurice EISENHAUER. May WHYNOCK and Daniel Maurice EISENHAUER were married on 30 August 1911 in Lunenburg, Lunenburg County, Nova Scotia. Minnie Louise WHYNOCK was born on 10 October 1894. She died on 10 July 1979 at the age of 84. She was buried in the Lower Blue Rocks Cemetery. Parents: Henry Benjamin WHYNOCK and Ada Anna (twin) TANNER. Spouse: Henry J. WHYNACHT. Minnie Louise WHYNOCK and Henry J. WHYNACHT were married on 27 December 1912 in Black Rocks, Lunenburg County, Nova Scotia. Living (private). Parents: Henry Ladonia WHYNOCK and Marie V BENJAMIN. Patrick Adolphius WHYNOCK was born on 9 December 1887. He died in December 1916 at the age of 29. He was lost at sea on the vessel "Mary F. Flemming". Parents: Johan Francis WHYNOCK and Sophia Rosina MORASH. 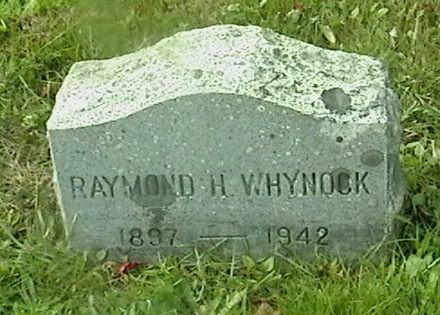 Raymond Harold WHYNOCK was born on 23 May 1897 in Voglers Cove, Lunenburg County, Nova Scotia. He died on 27 December 1942 at the age of 45 in Gloucester, Essex County, Massachusetts. He was buried at the Fisherman's Rest Area in the Beech Brook Cemetery in Gloucester. Parents: George James WHYNOCK and Bertha Martha BOWERS. Spouse: Violet Ethel HOBBS. Violet Ethel HOBBS and Raymond Harold WHYNOCK were married on 19 August 1918 in England. Children were: Henry Ladonia WHYNOCK, Stanley Cecil WHYNOCK, Lillian Bertha WHYNOCK, Kenneth Raymond WHYNOCK. Robert Francis WHYNOCK was born on 25 January 1871 in Blue Rocks, Lunenburg County, Nova Scotia. He died on 12 December 1961 at the age of 90 in Lunenburg, Lunenburg County, Nova Scotia. He was buried in the Hill Crest Cemetery in Lunenburg. Parents: Johan Francis WHYNOCK and Sophia Rosina MORASH. Spouse: Roselia WHYNOT. Roselia WHYNOT and Robert Francis WHYNOCK were married on 29 September 1892. Living (private). Parents: Kenneth Raymond WHYNOCK and Living. Sarah Elizabeth WHYNOCK was born on 30 December 1872. Parents: Johan Francis WHYNOCK and Sophia Rosina MORASH. Sarah Rosanna WHYNOCK was born on 11 March 1859 in Blue Rocks, Lunenburg County, Nova Scotia. She was adopted by John Conrad Weinacht. She died on 22 November 1945 at the age of 86 in Gloucester, Essex County, Massachusetts. She was adopted. Sarah was buried in the Beech Brook Cemetery in Gloucester. Parents: Johan Conrad WEINACHT and Margaret Elizabeth KNICKLE. Parents: Edward ALLEN and Margaret Elizabeth KNICKLE. Spouse: John Peter TANNER. Sarah Rosanna WHYNOCK and John Peter TANNER were married on 3 October 1882. Sophia WHYNOCK was born on 4 January 1868 in Blue Rocks, Lunenburg County, Nova Scotia. She died on 30 January 1962 at the age of 94. She was buried in the Hill Crest Cemetery in Lunenburg. Parents: Johan Francis WHYNOCK and Sophia Rosina MORASH. Spouse: Henry Isaac WALTERS. Sophia WHYNOCK and Henry Isaac WALTERS were married on 11 March 1884. Children were: Genieve Letta WALTERS, James Clarence WALTERS, Cecillia Sevilla "Sadie" WALTERS, Willis Fraser WALTERS, Mammie Ellen WALTERS, Katie Elizabeth WALTERS, Howard Truman WALTERS, Harry Whitman Chesley WALTERS, Jason Napolen WALTERS, Margaret Evelyn "Maggie" WALTERS, Angus WALTERS, Elizabeth Sophia WALTERS. Stanley Cecil WHYNOCK was born on 14 October 1923 in Voglers Cove, Lunenburg County, Nova Scotia. He died on 4 August 2002 at the age of 78 in Waltham, Middlesex County, Massachusetts. He was buried in the North Beverly Cemetery in Beverly, Massachusetts. Parents: Raymond Harold WHYNOCK and Violet Ethel HOBBS. Spouse: Virginia LOS. Virginia LOS and Stanley Cecil WHYNOCK were married in 1941. Children were: Stanley Cecil WHYNOCK. Spouse: Louise Margaret SCANNELL. Louise Margaret SCANNELL and Stanley Cecil WHYNOCK were married in 1949. Stanley Cecil WHYNOCK was born in 1941. Parents: Stanley Cecil WHYNOCK and Virginia LOS. Stewart WHYNOCK was born on 18 August 1892. He died in December 1916 at the age of 24. He was lost at sea on the vessel "Mary F. Flemming". Parents: Johan Francis WHYNOCK and Sophia Rosina MORASH. William Alfred WHYNOCK was born on 20 July 1882 in Lunenburg, Lunenburg County, Nova Scotia. He died on 22 August 1954 at the age of 72 in Lunenburg, Lunenburg County, Nova Scotia. He was buried in the Hill Crest Cemetery in Lunenburg. Parents: Martin Alfred WHYNACHT and Mary MORASH. Spouse: Florence Gertrude SILVER. Florence Gertrude SILVER and William Alfred WHYNOCK were married on 3 October 1911 in Lunenburg, Lunenburg County, Nova Scotia. Children were: George William WHYNACHT, Ronald Alfred WHYNACHT, William Raymond WHYNACHT. William Roger WHYNOCK was born on 9 June 1889 in Black Rocks, Lunenburg County, Nova Scotia. He died on 24 March 1890 at the age of 0 in Black Rocks, Lunenburg County, Nova Scotia. Parents: Henry Benjamin WHYNOCK and Ada Anna (twin) TANNER. WHYNOT was born on 20 July 1922 in Port Medway, Queens County, Nova Scotia. He died on 20 July 1922 at the age of 0 in Port Medway, Queens County, Nova Scotia. He was buried in the Old Cemetery in Port Medway. Parents: Edward Chesley WHYNOT and Georgina Birdie NOWE. Abraham WHYNOT was born on 10 February 1886 in Liverpool, Queens County, Nova Scotia. He died on 9 January 1972 at the age of 85 in Shelburne, Shelburne County, Nova Scotia. He was buried in Shelburne, Shelburne County, Nova Scotia. Parents: John Ambrose WHYNOT and Cassandra Augusta OICKLE. Spouse: Catherine Lena CUNNINGHAM. Catherine Lena CUNNINGHAM and Abraham WHYNOT were married on 16 December 1908 in Liverpool, Queens County, Nova Scotia. Ada (twin) WHYNOT was born on 13 August 1872. She died on 13 October 1872 at the age of 0. Parents: John Ambrose WHYNOT and Cassandra Augusta OICKLE. Ada Louisa WHYNOT was born on 29 May 1857. Parents: Johan George WEINACHT and Caroline ROBAR. Spouse: Henry Alfred JEWERS. Ada Louisa WHYNOT and Henry Alfred JEWERS were married on 22 September 1878 in Mahone Bay, Lunenburg County, Nova Scotia. Adam Clarence WHYNOT was born on 16 December 1874. He died on 28 February 1944 at the age of 69. He was buried in the Holy Redeemer Anglican Church Cemetery in Port Medway. Parents: George Alexander WEINACHT and Cassandra TANNER. Adelaide WHYNOT was born in 1879. Parents: Charles Henry WHYNOT and Catherine ROBAR. Ainsley B. WHYNOT was born on 25 October 1864. Parents: John Cyrus WHYNACHT and Narcissa Rosella MELDRUM. Spouse: Catherine A. HUBLEY. Catherine A. HUBLEY and Ainsley B. WHYNOT were married on 7 December 1892 in Bridgewater, Lunenburg County, Nova Scotia. Spouse: May Hattie RAMEY. May Hattie RAMEY and Ainsley B. WHYNOT were married on 11 March 1909 in Wentzell's Lake, Lunenburg County, Nova Scotia. Alexander WHYNOT was born on 29 June 1845. He died on 18 April 1927 at the age of 81. He was buried in the West Zion United Church Cemetery on Payzant Street in Liverpool. Parents: John Henry WEINACHT and Elizabeth Ann KRAUSS. Spouse: Elizabeth Eleanor WENTZELL. Elizabeth Eleanor WENTZELL and Alexander WHYNOT were married on 12 October 1871 in Liverpool, Queens County, Nova Scotia. Children were: George Alexander WHYNOT. Spouse: Susie Jane ELLIS. Susie Jane ELLIS and Alexander WHYNOT were married on 27 August 1902. Alexander WHYNOT was born on 1 June 1879 in Middlewood, Lunenburg County, Nova Scotia. He died on 11 May 1957 at the age of 77 in Middlewood, Lunenburg County, Nova Scotia. He was buried in the Middlewood United Cemetery in Middlewood. Parents: James Frederick WHYNOT and Lavinia MEISNER. Spouse: Elizabeth Caroline FANCY. Elizabeth Caroline FANCY and Alexander WHYNOT were married on 11 July 1903 in Mill Village, Queens County, Nova Scotia. Children were: Hazel May WHYNOT, Thelma Rose WHYNOT. Alfred Esmond WHYNOT was born on 20 April 1903 in Liverpool, Queens County, Nova Scotia. He died on 9 September 1990 at the age of 87. Parents: William Henry WHYNOT and Annie Elizabeth WHYNOT. Spouse: Esther May VEINOT. Esther May VEINOT and Alfred Esmond WHYNOT were married on 30 November 1926 in Liverpool, Queens County, Nova Scotia. Children were: Erma Ruth WHYNOT. Alfrieda Victoria WHYNOT was born on 6 December 1878 in Milton, Queens County, Nova Scotia. She died on 27 January 1971 at the age of 92 in Annapolis Royal, Annapolis County, Nova Scotia. Parents: John Richard WHYNOT and Waity WHYNOT. Spouse: Robert Henry CROFT. Alfrieda Victoria WHYNOT and Robert Henry CROFT were married on 26 January 1895 in Liverpool, Queens County, Nova Scotia. Alice May WHYNOT was born on 6 April 1918. She died on 21 September 1981 at the age of 63. She was buried in the Fairview Cemetery in Lawrencetown, Annapolis County, Nova Scotia. Parents: James William WHYNOT and Effie H. HUBBARD. Spouse: Henry Wakefield LOHNES. Alice May WHYNOT and Henry Wakefield LOHNES were married on 22 August 1936 in West Berlin, Queens County, Nova Scotia. They filed for divorce on 4 December 1973. Children were: Lambert Maxwell LOHNES, Lalia Selina LOHNES, Freeman Henry LOHNES, Living, Living, Living. Allan WHYNOT was born on 14 July 1846. Parents: Johann Nelson WHYNOT and Sarah Sophia Elizabeth FRANCK.